China controlled areas of present-day Viet Nam from c111 BCE to 938 CE, and during this time numerous Chinese practices were adapted by the Vietnamese. In 1744, for example, imperial, civil and military officials began wearing large, square badges on their robes to identify their rank. Bird imagery on the badges indicated a rank within the civil administration and animal badges established military positions. The imagery of on the badges symbolises auspicious themes, such as immortality, happiness, success and wealth. Even though the concept of rank badges originated in China, Vietnamese badges evolved their own form. Vietnamese robes are fastened on the side and therefore the front badge was not divided as in China where robes closed at the front. 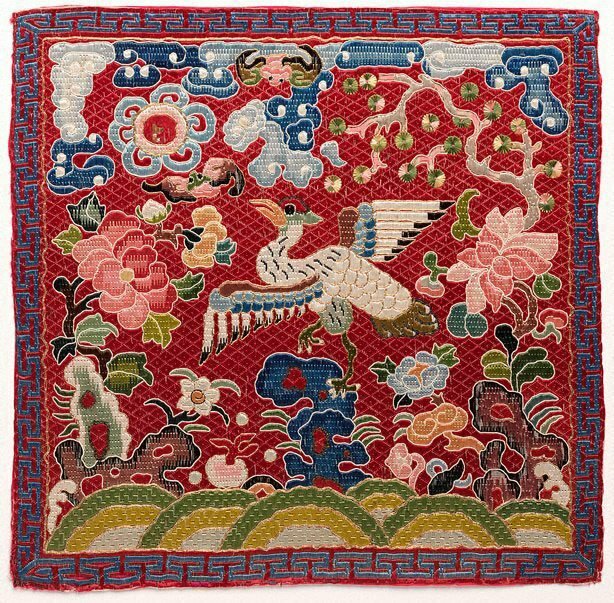 Moreover, Vietnamese badges have a red background, a feature of many Southeast Asian textiles and paintings. Similar to practices in China, Vietnamese officials attempted to trick people into believing that their rank was higher than it actually was. They did this by wearing badges that displayed birds or animals associated with a lower rank combined with design elements belonging to higher ranking officials.